Giving someone credit for unearthing the cannabis plant’s medicinal powers is like trying to name the person who invented chocolate. Our ancient ancestors have been using weed to treat a whole host of ailments and medical conditions for thousands of years. Way back in 4,000 BC, weed was considered one of the “five grains” in China and was harvested as an important food crop. Some time later, in 2737 BC, the first recorded use of cannabis as a medicinal drug was confirmed. 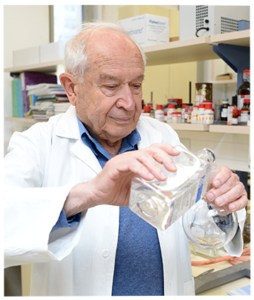 His real name is Raphael Mechoulam and he has been studying THC and CBD for more than 30 years. An 88-year-old Israeli organic chemist and professor of Medicinal Chemistry at the Hebrew University of Jerusalem in Israel, Mechoulam was born in Bulgaria on November 5, 1930. Since he started research on cannabis in the 1960s – when he asked a police station if he could use the confiscated weed to perform the research – Professor Mechoulam has been nominated for 25 separate academic awards, one of which was a Nobel Prize! So influential have his research efforts been amidst the rise of cannabis reform that he even had a 2015 movie documentary called ‘The Scientist’ produced in his honor. Back in 1949, Mechoulam immigrated to Israel with his family. It was there that he began studying chemistry and earned his Ph.D. at the Weizmann Institute, Rehovot, in 1958. Following postdoctoral studies at the Rockefeller Institute, New York from 1959–1960, Mechoulam joined the scientific staff of the Weizmann Institute (1960–65), before leaving for the position of professor at the Hebrew University of Jerusalem in 1972. From 1975, he assumed the role of professor at Lionel Jacobson Professor of Medicinal Chemistry. Mechoulam discovered that some 150 years ago, researchers accomplished the task of isolating morphine from opium. A century before, researchers managed to isolate cocaine from coca leaves, but what about cannabis and its all-important cannabinoids? Pondering over the thought led to Mechoulam and his colleagues acting on it. Within a few months, they had determined a method of testing cannabis’ medicinal properties. Since his early years of cannabis research in the 1960s, Mechoulam has made some crucial contributions to the science of cannabinoids and the human body’s powerful endocannabinoid system (ECS). When he was aged just 34 years, Prof Raphael Mechoulam teamed up with his colleague Prof Yechiel Gaoni to publish a pioneering scientific article that highlighted how they successfully analyzed and synthesized the cannabis plant’s main psychoactive ingredient tetrahydrocannabinol (THC). In the years that followed, further work on the cannabis plant took place and the ECS was identified for the first time. A separate research project kick-started by Mechoulam resulted in the isolation of anandamide, which was the world’s first described endocannabinoid. It was in the year 1992 that two of Mechoulam’s postdoctoral researchers isolated and characterized anandamide. Mechoulam’s work soon propelled him to the top of the medical cannabis testing totem pole, not to mention earned him countless honors and awards, including the Israel Prize in 2000 and the NIDA Discovery Award in 2011, among many others. In addition to his research efforts, Mechoulam serves as an advisor to the Israeli Ministry of Health. Most recently, Mechoulam joined the scientific advisory committeeof Israeli medical cannabis company Cannbit. Mechoulam’s outstanding lifework, combined with the rise of medical cannabis research in Israel, has helped millions of people suffering from plant-treatable conditions. It is thanks in large part to Mechoulam’s research over the past half century that doctors are now able to prescribe cannabis to patients for the treatment of widespread medical ailments and disorders. One of his most impressive achievements was the isolation of Δ9-tetrahydrocannabinol, A.K.A “THC”. This psychoactive chemical compound is the most abundant of the plant’s naturally occurring cannabinoids. Something else that can be attributed to Mechoulam’s hard work and knowledge is the establishment of the structure of cannabidiol (CBD). While he might not have been the man to isolate CBD for the first time, Mechoulam was the first to distinguish its structure. Such a tremendous accomplishment sent ripples of excitement across the world and informed people about the cannabis plant’s medicinal and therapeutic qualities. In addition to this, the professor identified the brain’s first endogenous cannabinoid – Anandamide. This cannabinoid was one of the compounds that triggers cannabis’ receptors, thus activating them in the process. In Sanskrit, Anandamide is translated as “supreme joy”. His discovery of a second endogenous compound, named 2-AG, opened new doors for endocannabinoid research. As a pro-pot professor with a strong influence on the moulding of the medical cannabis industry, Mechoulam (unsurprisingly) does not agree with cannabis’ Schedule 1 classification.